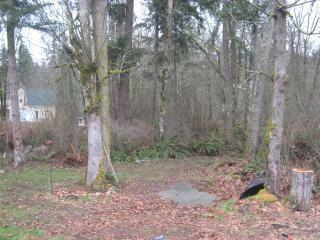 This is the future location of our chicken coop. First, we need to level the ground. 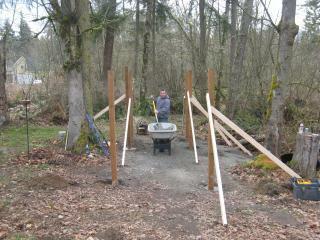 We used 5/8" gravel to fill and level because here in WA dirt just turns to mud, not very good for a solid foundation. Plus, once compacted, the rocks are almost like cement but a lot cheaper. Two yards of gravel came to about $60. Pressure treated posts cemented in the ground. Waiting for the cement to dry in spots. 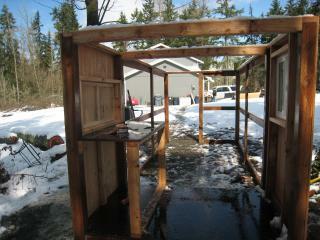 Most of the framing is complete. 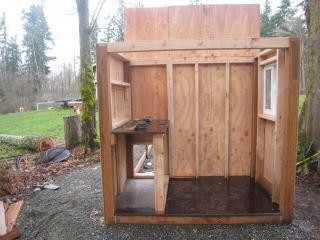 This will be the inside of the coop - 4'x6'. On the right, a low-e sliding window with a screen. 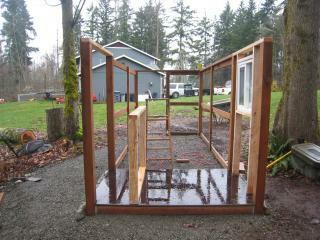 On the left, the framing for the nesting boxes. We used marine grade plywood flooring. This will prevent odor and moisture from being absorbed into the wood and help it last longer. 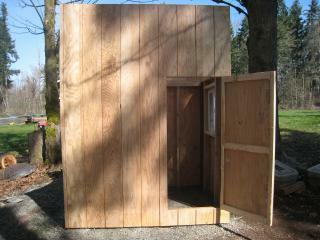 We used the marine grade plywood for the nesting box floor too. 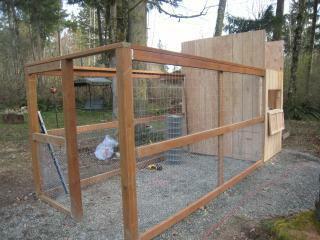 Then added a door to access the nesting boxes and someday eggs-YEAH!!! As you can see, the weather is so unpredictible in WA. Within 24hours it was sunny, rained, hailed, snowed (5 1/2 inches) and then was sunny again - CRAZY!!! Watch, the minute we're done the weather will be sunny and 70` for weeks! 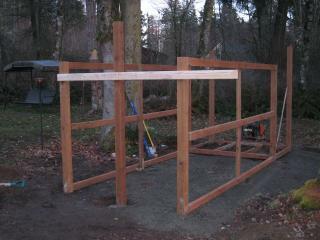 Three of the four walls done. 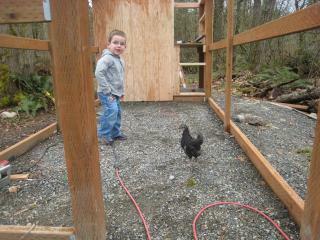 Under the nesting boxes is the chicken's door to the run. 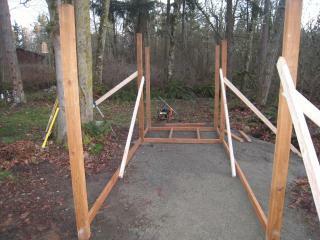 We built it so it will double as the ramp too, with hindges and a lock. The fourth wall is done, YES!!! Thanks for posting pictures along with the details. Made it very easy to follow. 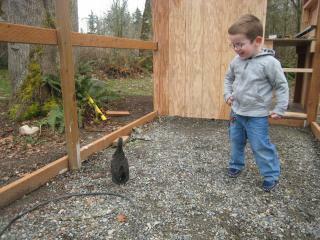 Hope your chickens are enjoying the coop. Thank you!!! 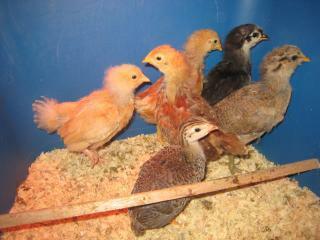 This was, and still is, an amazing experience for us...I can't imagine my life without my chickens! Nicely done! All the pictures were great - cute little helpers. What a nice family project.